Docker is an open-source project that provides an open platform for developers and sysadmins to build, package, and run applications anywhere as a lightweight container. Docker automates the deployment of applications inside software containers. Django is a web application framework written in python that follows the MVC (Model-View-Controller) architecture. It is available for free and released under an open source license. It is fast and designed to help developers get their application online as quickly as possible. In this tutorial, I will show you step-by-step how to create a docker image for an existing Django application project in Ubuntu 16.04. We will learn about dockerizing a python Django application, and then deploy the application as a container to the docker environment using a docker-compose script. In order to deploy our python Django application, we need additional docker images. We need an nginx docker image for the web server and PostgreSQL image for the database. In this tutorial, we will install docker-ce community edition from the docker repository. We will install docker-ce community edition and docker-compose that support compose file version 3. Before installing docker-ce, install docker dependencies needed using the apt command. Now add the docker key and repository by running commands below. Update the repository and install docker-ce. After the installation is complete, start the docker service and enable it to launch every time at system boot. Next, we will add a new user named 'omar' and add it to the docker group. 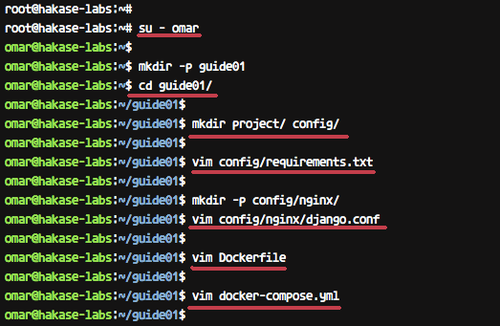 Login as the omar user and run docker command as shown below. Make sure you get the hello-world message from Docker. Docker-ce installation has been completed. In this tutorial, we will be using the latest docker-compose support for compose file version 3. We will install docker-compose manually. Download the latest version of docker-compose using curl command to the '/usr/local/bin' directory and make it executable using chmod. Now check the docker-compose version. And make sure you get the latest version of the docker-compose 1.21. 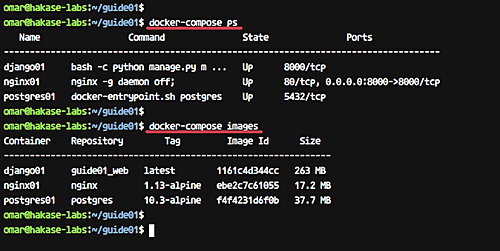 The docker-compose latest version that supports compose file version 3 has been installed. In this step, we will configure the python Django project environment. We will create new directory 'guide01' and make it as the main directory for our project files, such as a Dockerfile, Django project, nginx configuration file etc. Login to the 'omar' user. Create new directory 'guide01' and go to the directory. Now inside the 'guide01' directory, create new directories 'project' and 'config'. Directory 'project': All our python Django project files will be placed in that directory. Directory 'config': Directory for the project configuration files, including nginx configuration file, python pip requirements file etc. Next, create new file 'requirements.txt' inside the 'config' directory using vim command. Under the config directory, create the 'nginx' configuration directory and add the virtual host configuration file django.conf. Create new 'Dockerfile' inside the 'guide01' directory. Now paste Dockerfile script below. We want to build the Docker images for our Django project based on Alpine Linux, the smallest size of Linux. Our Django project will run Alpine Linux with python 3.5 installed on top of it and add the postgresql-dev package for the PostgreSQL database support. And then we will install all python packages listed on the 'requirements.txt' file using python pip command, and create new '/src' for our project. Create the 'docker-compose.yml' file under the 'guide01' directory using vim command below. command: bash -c "python manage.py makemigrations && python manage.py migrate && python manage.py collectstatic --noinput && gunicorn hello_django.wsgi -b 0.0.0.0:8000"
With this docker-compose file script, we will create three services. Create the database service named 'db' using the PostgreSQL alpine Linux, create the 'nginx' service using the Nginx alpine Linux again, and create our python Django container using the custom docker images generated from our Dockerfile. Copy your Django project files to the 'project' directory. Go to the 'project' directory and edit the application setting 'settings.py'. We will deploy simple Django application called 'hello_django' app. On the 'ALLOW_HOSTS' line, add the service name 'web'. Now change the database settings. We will be using the PostgreSQL database that runs as a service named 'db' with default user and password. And for the 'STATIC_ROOT' configuration directory, add this line to the end of the line of the file. Now we're ready to build and run the Django project under the docker container. In this step, we want to build a Docker image for our Django project using the configuration on the 'guide01' directory. Go to the 'guide01' directory. 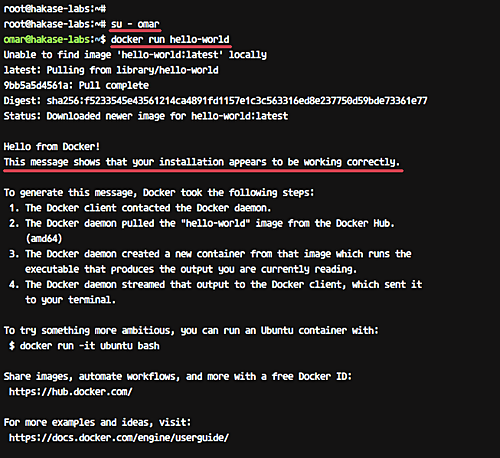 Now build the docker images using the docker-compose command. Start all services inside the docker-compose script. Wait for some minutes for Docker to build our Python image and download the nginx and postgresql docker images. 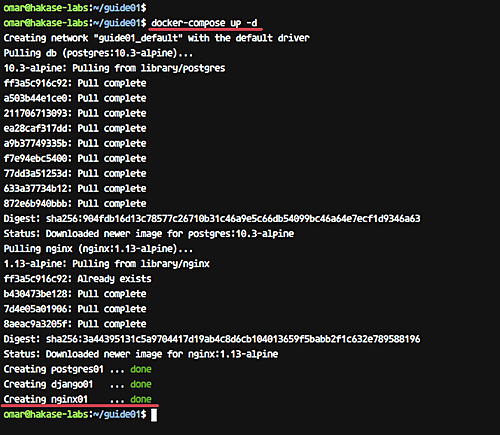 And when it's complete, check running container and list docker images on the system using following commands. And now you will get three containers running and list of Docker images on the system as shown below. Our Python Django Application is now running inside the docker container, and docker images for our service have been created. 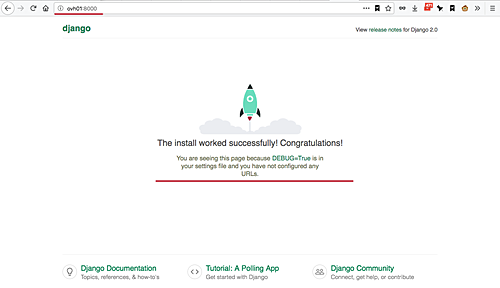 Now you will get the default Django home page. Next, test the admin page by adding the '/admin' path on the URL. 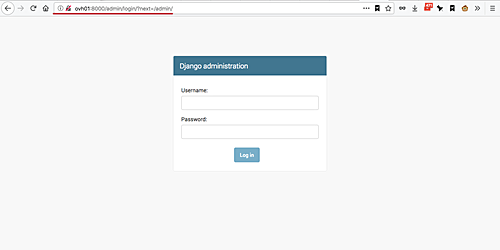 And you will see the Django admin login page. The Dockerizing Python Django Application has been completed successfully. Hello Muhammad, thank you so much for the tutorial. There's something I want to note: if I did not miss something, it should be better to replace - ./project:/src lines with - ./project/hello_django:/src. Otherwise it does not work, at least in my case. i am working on a aws ubuntu instancein my case everything was okay, ran properly but when i am trying to check on web server it is showing "connection refused"can you please help what to do?